It’s hard to imagine that Spring is really here, what with the blizzards and freezing winds we have been experiencing recently. Nevertheless, the buds are beginning to unfurl on the trees and the leaves of wild garlic are poking their way up through the mud and snow. Wild garlic, (Allium ursinum), has to be one of our most exciting and useful wild-growing spring greens. It loves to grow in shady, damp areas and along the riverside is a perfect setting for it. It is also an Ancient Woodland Indicator and carpets much of the damp woodland floors around here in early Spring. The lance like, bright green leaves can grow up to 25 cm in length and the spherical flower heads are creamy-white in colour with small, star-like individual flowers. All parts of wild garlic are edible, the leaves can be picked right now and added to salads or made into pesto. Later on the flowers and green seeds make a delicious, crunchy treat and the root, or bulb, may be harvested later on in the summer when the leaves have turned yellow. These can be used in cooking in much the same way as the cloves of shop bought garlic which we may be more familiar with. So, what are the properties of garlic, apart from warding off vampires of course? It is strongly anti-bacterial, anti-viral and anti-fungal, it is also an expectorant making it good for coughs and colds. Garlic reduces levels of bad cholesterol, dilates blood vessels and thins the blood, so it is a good cardiovascular tonic. But be aware that it can interact with blood thinning medications such as aspirin and warfarin, so don’t consume it in large quantities if you are taking these medications. 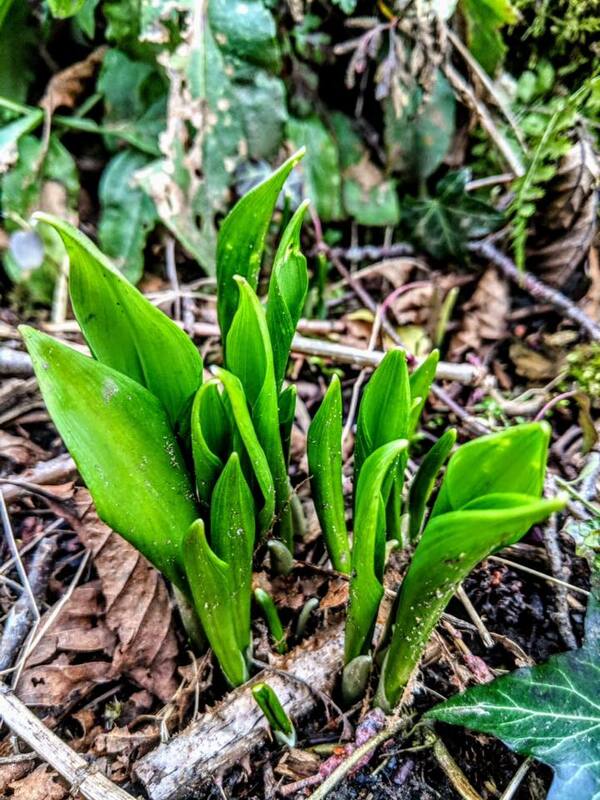 Be careful when harvesting the leaves as there are a couple of poisonous look a likes that can grow amongst wild garlic. The two to watch out for are Lords and ladies and Lily-of-the-valley. The former is far more common than the latter but both can be found in damp woodland areas. Make sure to familiarise yourself with how they look and don’t just go with the old adage “…if it smells like garlic, it is garlic”, if you’ve been picking lots of garlic leaves, your hands and all the other leaves you touch will smell like garlic too! The golden rule, as with all foraged material, is to check the leaves when you pick them, check again when you sort through them and check once more before adding them to your recipe.